Upbeat earnings and favorable guidance have traders cheering. In response to the announcement of third-quarter results, shares of Sensata Technologies (NYSE:ST), a leading provider of sensors, were up 11% as of 3:16 p.m. EDT on Tuesday. Revenue jumped 7% to $874 million. For perspective, market watchers were expecting only $866 million in revenue. Adjusted net income grew 11% to $154 million, or $0.91 per share. That figure matched the consensus estimates among analysts. The company announced a new $250 million share-repurchase program. Revenue is expected to land between $853 million and $877 million. That represents growth of 2% to 4%. The midpoint of the range is slightly ahead of the $863 million that Wall Street had projected. Adjusted earnings per share are expected to land between $0.97 and $1.01 in the fourth quarter, which represents growth of 12% to 16%. That's right in line with what analysts were modeling. Between the upbeat quarterly results, increased capital return program, and favorable guidance, it isn't hard to figure out why Wall Street is happy today. Investing in tech hardware companies is difficult because these types of businesses face relentless pressure from their customers to lower prices. That can cause margins to wax and wane in the long term, which is exactly what has happened to Sensata. 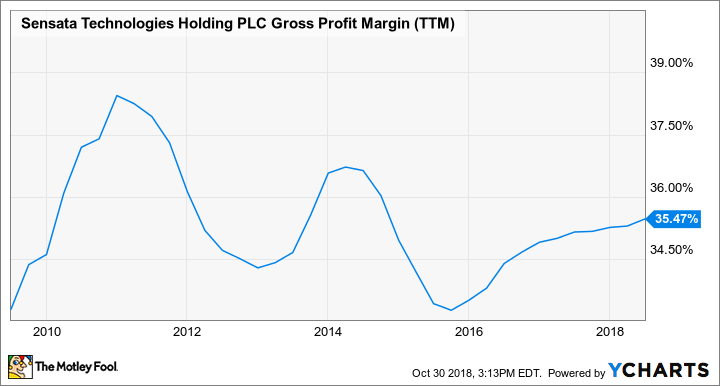 ST Gross Profit Margin (TTM) data by YCharts. Sensata is on an upswing right now, but I don't have a lot of confidence in this business's ability to maintain its pricing power over the long term. For that reason, I'm content to root for this company's success from the safety of the sidelines and focus my capital on more promising opportunities. This Metric Suggests You're Right to Own Sensata Technologies Holding. Will Sensata Technologies Holding Earn or Burn?